Atheism may seem intellectual, but it’s the epitome of foolishness. It’s a worldview that has snuffed out its God-given light. Yet, increasingly, you may encounter atheists in your workplace, your neighbourhood, or even your home. Promotional material (video trailer, printable poster and flyer, social media art, etc. 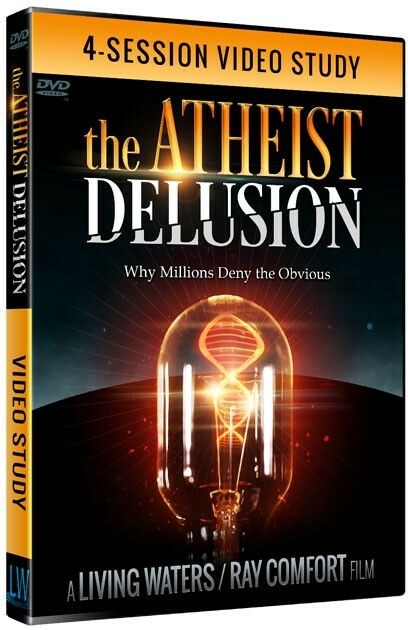 )Ray Comfort, Executive Producer of “The Atheist Delusion,” is Founder/CEO of Living Waters and a best-selling author of more than 80 books. He co-hosts the award-winning television program “The Way of the Master,” seen in over 190 countries.Emeal (“E.Z.”) Zwayne, Executive Producer of “The Atheist Delusion,” as well as other Living Waters’ films such as “180” and “Evolution vs. God,” is the President of Living Waters. E.Z. is a prolific speaker who is featured at various conferences, churches, and learning institutions around the world.Mark Spence, Producer of “The Atheist Delusion,” is the Vice President of Outreach at Living Waters. Mark is also the Dean of the School of Biblical Evangelism (BiblicalEvangelism.com), which has had over 16,000 students, and is a popular conference speaker.